Both sophisticated and cheesy, the film sports impressive, powerful, hard-hitting drama and action, but in the beat of an eye drops so swiftly into campy dialogue that awe-struck audience members burst out in an unflattering laughter. Unfortunately, the cartoony villain would play better against Rocky and Bulwinkle than nose to nose here with Tom Cruise (who thankfully shares most of his screen time with the beautiful and talented Rosemund Pike). Reacher, himself isn't that far from comic book hero status; however, as we know, cape or no-cape, those crusaders have done pretty well for themselves in Hollywood. This certainly feels like a series, and despite the unevenness, I would see the sequel especially if paired again with Pike. Some people have a hard time with violence on screen. Given that this film releases shortly after the tragedy in Connecticut, the opening sequence will be all the more difficult to endure. That said, the action is shot and directed well, especially a car chase (excellent V8 sound mixing) in the middle of the production. Duvall also gives a fun performance, albeit not much more than a cameo. 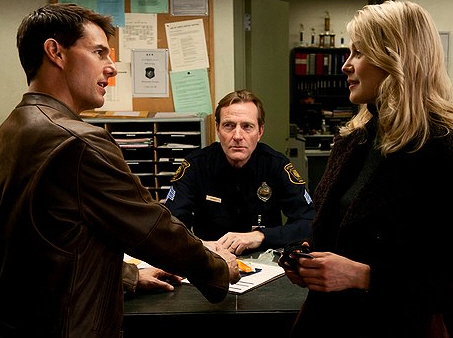 Jack Reacher. Copyright © 2012. Starring Tom Cruise, Rosamund Pike, Robert Duvall, Werner Herzog, Richard Jenkins, David Oyelowo. Screenplay by and Directed by Christopher McQuarrie. Paramount.